I definitely do. Friends you haven't seen for awhile and wanting to catch up on what they have been up to since the last you have seen each other. Probably reminiscing and regal on the old days as well. This is how I feel about my long lost time since the last time I had tasted chef Ludo Lefebre's cooking. Back in the old day, I was introduced to his wonderful and whimsical creative dishes from his pop up series called LudoBites. This is where he had limited engagements in a temporary dining space that he can used to display his cooking without the commitment of long term lease. These engagements tends to only last for weeks, maybe at best a month or so. Out of those series, I was able to attend three of them and have written about the second and third of his popup series here (LudoBites II and III). Just like catching up with old friends, I wondered what he and his lovely wife Krissy was up to. I do followed Krissy on twitter and noticed they have two children since my last visit on LudoBites IV. To my amazement, Ludo himself is a TV celebrity chef (you can imdb him up), opened up a food truck, then set up set in a sporting arena, and then partnered up with two of the local celebrities chef like himself to open up a slew of restaurants. 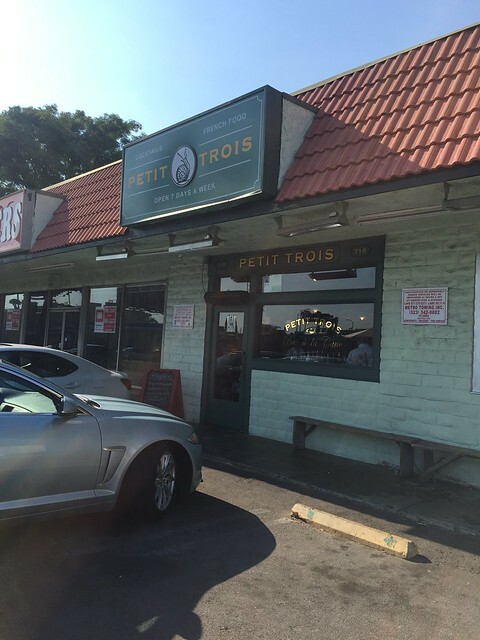 One of the so said restaurant is Petit Trois that I am visiting. It's a 2nd incarnation of their full fledged sit-down full service restaurant with Trois Mec being the flagship first. 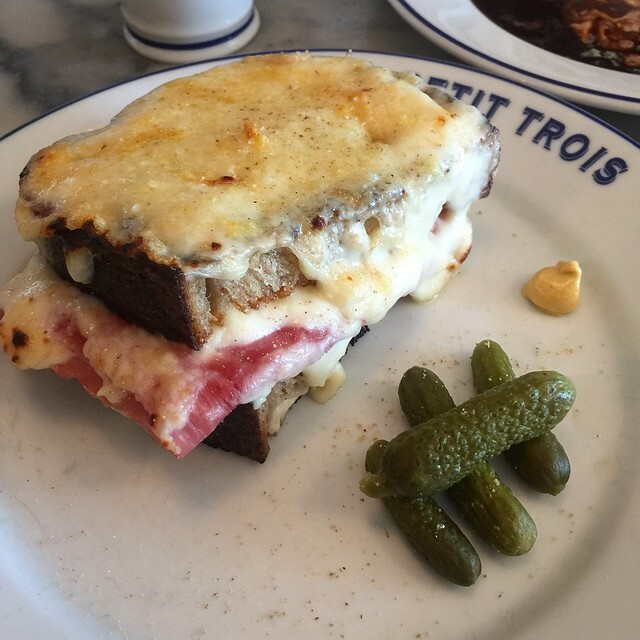 Petit was considered a casual bistro with brunch made available while Trois was set up as a refined dinner course set up. The subtle differences make it a challenge to go to Trois was you have to prepaid with a reservation (ticketing system) and a set menu for that day. As in for Petit, it was a first come first serve and you can do an a la carte from the menu. You can obviously guess which of the two restaurant would fancied me more to my liking. Additionally, I prefer to go for the brunch in this case because of the limited time schedule on my visit in that area, so Trois would totally be out of the picture. 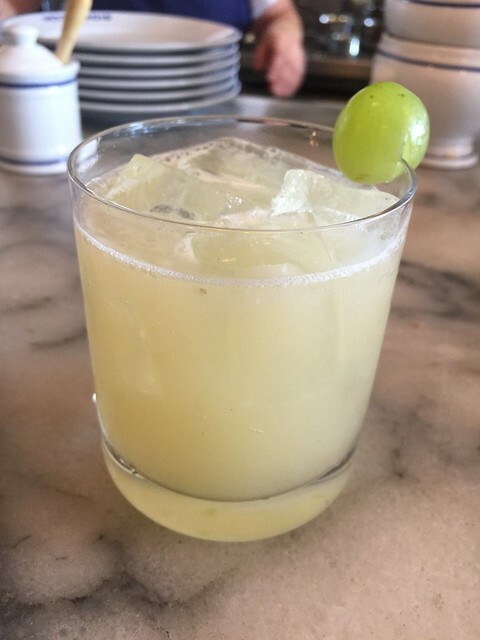 Like catching up and reminiscing, I really missed some of Ludo's cooking and wanting to see if I can get his Madame Monsieur. Oh believe me, it's just how I remembered it from the good ol' days from his pop up. After getting a bite of this savory and cheesy ham sandwich that was forged from epitome of fine French casual, I'm just wondering why I took that long to visit. It was way too long. The most talked about dish in this place was his interpretation of a big mac. Do you remembered the quote from the movie "Pulp Fiction" where the question get asked what do you called a Big Mac in Paris?... Le Big Mac! Well, you can guess what's coming on this too. The cheese burger that is presented was decadent as it is and very rich in the flavor. From a perspective, I really love the fact it's not a ground beef, but like a piece of steak patties that is proportionally correct with the bun ratio. Then you get the bordelaise sauce and aioli enhancing that rich beef flavor to the max. You will never settle for just the big mac again. Yup, Le Big Mec all the way! The dessert was right on the money too. Everyone suggested in getting the Napoleon, a fluffy pastry cream between flour-less chocolate cake and filled with Tahitian Ice Cream was just out of this world. I am still dreamy about this after looking at this photo visually that I wished I can simply walked back in there to order this. Before you plan to make a visit here, please do note in that they only take credit cards. Hard currency will not be accepted as they are going on digital currency. So be aware of this as some of the restaurants are planing to go in the way of digital transactions with even thought of Apple Pay or digital wallet as you call it are the trend of accepted payments. Like all good friends that you haven't seen in a long while, I definitely will need to catch up on some of his other newer dishes that is getting props such as Brittany Wild Sole “MEUNIÈRE. Apparently that fish dish is a new must ordered item on the menu in this establishment. After meeting long time friends, we all promised to meet again soon. This appointment I will have no problem keeping.